Afternoon tea, cakes and conversation with two authors. We’re very excited at the Millennium Library to be playing host to two fabulous authors this November as we commemorate Armistice Day. 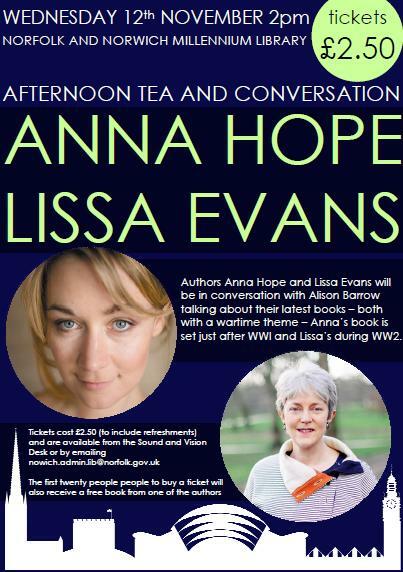 Anna Hope, who has written a fantastic debut novel called Wake all about the burial of the Unknown Warrior, and Lissa Evans, whose novel Crooked Heart is about the impact of WW2 on people, will be in conversation about their books with Alison Barrow from Transworld publishing. The event will start at 2pm with tea and cakes and then the authors will talk about their books and take questions from the audience for about an hour. Tickets to this event are just £2.50 and thanks to the generosity of the publisher the first twenty people to book a place will receive a free hardback novel from one of our guests. Can’t wait to read this one. I am reading a novel right now about the Vietnam war and the impact on the people involved on both sides. It is fiction, but it seems very real to me. Hearts, Minds and Coffee by Kent Hinckley is the book. I recommend it, kenthinckley.com is his site for his info. I love this genre, military, history all of it. Thanks for this post I would not have known about this book otherwise! Thanks for the kinds words, I’ve now read Wake and loved it and am about to start Crooked Heart but will add your recommendation to my list as well – will you make it to our event?